Sometimes you just need chocolate cake. Not want, need. But you don’t want a huge chocolate cake, nor do you want to wait 45 minutes for it to come out of the oven. No, you need cake, in your mouth, within 5 minutes. The caveat is that it has to be good, or else it’s not worth it. Forget frozen cakes that taste of sadness after being defrosted. 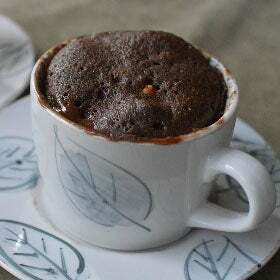 Instead, make yourself a little decadent chocolate mug cake. The following recipe is light, fluffy, astonishingly chocolatey and can either make one really big piece of cake, or two, more reasonable pieces, in case you’re in the mood to share. We won’t judge you either way. 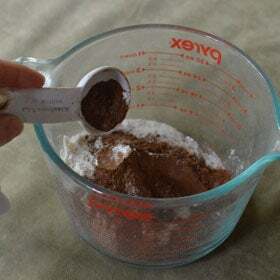 In a large measuring cup or small mixing bowl, whisk together all of the dry ingredients: flour, sugar, cocoa powder, baking powder, espresso extract and salt. 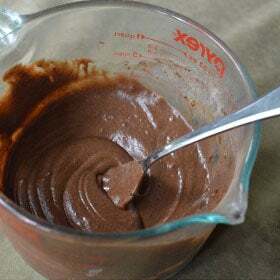 The espresso powder gives the chocolate flavor the extra depth that makes this cake so decadent. 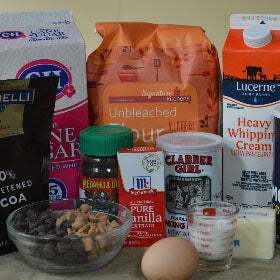 Add the wet ingredients to the dry mixture: melted butter, milk, heavy cream, egg, vanilla extract. 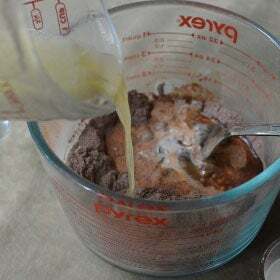 Pour cake batter into one large cereal bowl or two mugs. 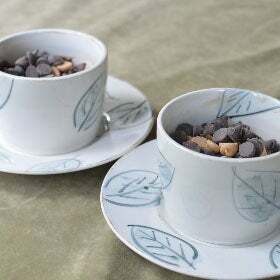 Sprinkle half of the chocolate chips and half of the peanut butter chips into each mug. The chocolate chips give the illusion of molten chocolate cake and the peanut butter chips add an interesting layer of saltiness to the cake. Microwave mugs for around 1 minute 30 seconds. Please note, everyone’s microwave is a little different. You might need to try this a couple of times before you find the cooking length that works for you. You’ll know the cake is done when it has risen and the top no longer looks raw. Let the cakes cool for a minute or two and serve hot. Delicious with a scoop of ice cream, a dollop of whipped cream or as is! Enjoy!